The postal dispute affecting Belfast for over a week may escalate as representatives of striking postal workers lobby colleagues in Derry and Enniskillen for support. The unofficial dispute which began last Tuesday 31 January saw workers walk out of Belfast's main sorting office in Tomb Street accusing management of using unfair disciplinary procedures against a number of Shankill Road based employees. They were joined by workers at the Mallusk sorting office, on Friday 3 February, which lead to widespread disruption of mail deliveries. Workers are now demanding that their employer, Royal Mail, adopt an independent industrial and employee relations review of it's disciplinary procedures, before they return to work. Royal Mail have refused saying it will only negotiate when the workers go back to work. The company inflamed matters when managers delivered letters to representatives of the Communications Workers' Union threatening legal action against them to recover financial losses. Accusing the employers of bullying tactics CWP Regional Secretary Lawrence Huston said the manner in which the letters were delivered was very distressing for representative's families. "These actions have put further burden and stress on the very people who have been working tirelessly to resolve this unofficial dispute and restore the service to the community." Meanwhile on Tuesday 7 February postal workers marched from Transport House in the city centre along the Shankill Road to a rally at Lanark Way interface, where community representatives and politicians addressed striking postal workers and representatives from West Belfast based community groups. Speaking at the rally Sinn Féin's Michael Ferguson welcomed the demonstration of working-class unity which saw the community of West Belfast supporting postal workers from the Shankill Road. Ferguson drew comparisons with the 1930s Outdoor Relief Strikes which saw workers from the Falls and Shankill come together to protest against Poor Law system operated by the unionist dominated Stormont government. Last November An Phoblacht reported a victorious settlement for workers in Doyle Concrete, located just outside Rathangan in County Kildare following a six-week-long strike. Less than two weeks after the settlement was announced however, management had torn up the agreed formula for a return to work. In the latest development the Labour Court has again backed SIPTU in the dispute centring over redundancy, rates of pay and scab workers. SIPTU's Kildare/Leixlip Branch Organiser Adrian Kane welcomed the victory and called on management at Doyle's to finally see sense. "Over the last few months SIPTU members in Doyle Concrete have been laid off," Mr Kane said, "while non-union employees — who broke the strike and who have considerably less service than our members -- were transferred from Doyle Concrete to Steelite". The company was using an old tax dodge of two companies, declared to be separate, but in fact one and the same, sacking workers in one, and employing new workers in the other. The two adjacent companies, sharing directors and management are Doyle Concrete and Steelite Ltd. The companies shared a common entrance, phone number and transport system. "The Court's recommendation is important for a number of reasons," said Mr Kane. "It has lifted the corporate veil and made nonsense of the bogus argument put forward by management that Doyle's and Steelite are two totally separate entities. Steelite and Doyle Concrete are essentially two divisions of the same company, and the Companies Office shows Steelite as being wholly owned by Doyle Concrete Ltd. The Court also said that management should provide SIPTU with written assurances that lower rates of pay no longer apply to non-national employees." A staggering 5,070 people have taken part in the LabourStart email campaign in the last three weeks to protest the dismissal of Joanne Delaney, fired by Dunnes Stores for wearing her union badge. 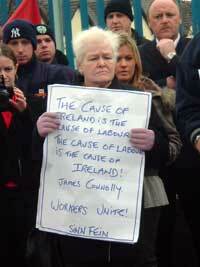 Delaney, a Shop Steward with Mandate, worked at the Crumlin store for over four years. As well as emails flooding into Dunnes Headquarters protests have taken place outside Dunnes branches in Dublin and Belfast while the issue was raised earlier this week in Dublin City Council. Those interested in supporting the campaign should log on to www.labourstart.org. Sinn Féin TDs Arthur Morgan and Aengus O Snodaigh met with Joanne and union officials in Leinster House on Wednesday in an effort to assist the campaign for her reinstatement. Speaking in the Dáil last Wednesday Sinn Féin's Arthur Morgan challenged the Minister for Enterprise, Trade and Employment Mícheál Martin to outline what actions he is taking to protect migrant workers who are employed as domestic workers. "Domestic workers are particularly vulnerable to exploitation because they work behind closed doors. They have less access to information about their rights and to trade unions," he said. "We need a guarantee from the Minister that specific action will be taken to ensure their rights are protected. Sinn Féin is calling for the introduction of employment regulation orders outlining rates of pay and minimum standards for domestic workers in light of increasing evidence that these workers are being exploited and mistreated," said Morgan. Afterward Morgan said he was "disappointed that the Minister had not set out a clear time framed plan to address the plight of migrant domestic workers" and by the Ministers "abdication of any responsibility in relation to the introduction of employment regulation orders to cover domestic workers". Sinn Féin Fisheries spokesperson Martin Ferris has congratulated the country's fishermen for this weeks protest against the new fisheries bill. "I will continue to highlight the injustice of this and the common fisheries policy. The actions and determination of the fishermen will ensure that this government is kept aware of the huge opposition to these measures that exists among the countries fishermen. With key votes in the European Parliament on the proposed Services Directive due next week, Sinn Féin has stepped up its campaign against the legislation, which is strenuously opposed by trade unions across Europe. 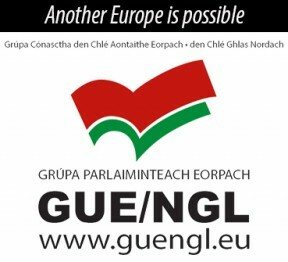 On Wednesday the party held a public meeting in Trinity College Dublin where Sinn Féin TD Aengus Ó Snodaigh was joined by SIPTU President Jack O'Connor and René Roovers of the GUE/NGL group in the European Parliament as well as Barry Finnegan from the Campaign Against the European Constitution. The party is also launching a newsletter laying out the case against the Directive and a protest is planned outside the EU Commission offices in Dublin for 14 February at 12.30pm, when the European Parliament will vote on the proposal. Speaking in advance of the meeting Aengus Ó Snodaigh said: "Sinn Féin was the only party to recognise the full threat posed by the Services Directive to workers and service users alike when it was first proposed by the European Commission and came before the Oireachtas EU Affairs Committee back in March 2004. "We welcome the recent increase in awareness raising activities by stakeholders and groups opposed to the Directive. It is essential that broad public debate precedes and informs the voting decisions of Irish representatives in both the European Parliament and Council and Sinn Féin is delighted to facilitate further discussion on the Directive." Among a number of anti-worker sections in the proposed Directive is key the 'country-of-origin' clause that would allow companies to trade across Europe on the basis of the labour laws in the country they are registered, and not the country they operate. In other words workers employed by a company registered in Estonia but operating in Ireland would be subject to Estonian labour law.